The diabetes market is massive and gets bigger every year. The numbers are so big that investors have lots of publicly traded companies to choose from that address diabetes treatment. So which diabetes stocks do our team of Motley Fool contributors have their eyes on right now? They’ve called out Dexcom (NASDAQ:DXCM), Tandem Diabetes Care (NASDAQ:TNDM), and Medtronic (NYSE:MDT). Todd Campbell (Dexcom): The expected launch of Abbott Labs’ (NYSE:ABT) next-generation Freestyle Libre 2.0 continuous glucose monitor (CGM) has increased worries that Dexcom’s status as the best-in-breed CGM player could be in jeopardy. 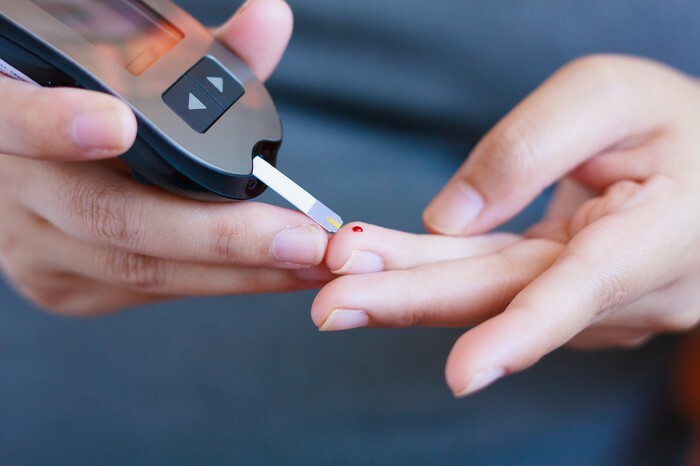 Diabetics often rely on frequent finger sticks to determine insulin dosing, but that approach only provides point-in-time insight, so patients spend a lot of their day outside their desired range. That’s a problem, because it can lead to dangerous glucose highs and lows that contribute to disease progression. To better control their disease, patients are embracing CGMs for real-time insight. Dexcom and Abbott are the biggest CGM manufacturers, and sales at both companies have been surging because of new products. Dexcom’s revenue has been rising because of its G6 launch in the U.S., while Abbott’s sales have benefited from the launch of the Freestyle Libre 2.0 in Europe. There’s no timeline for a Freestyle Libre 2.0 approval in the U.S., but it’s expected this year. When the Libre 2.0 launches, Abbott should be able to better compete against Dexcom, because the Libre 2.0 is the first Abbott system to include glucose high-and-low alarms, and its sensors last 14 days, versus 10 days for the G6. The Libre 2.0 is also expected to launch in the U.S. at a price that could undercut the G6, making it even more attractive to users. The Libre 2.0 threat shouldn’t be ignored, but investors might not want to bet against Dexcom. Millions of patients can benefit from CGMs, so there’s room for multiple offerings. In addition, the G6 is incorporated into Tandem Diabetes’ insulin delivery system, which pairs it with a pump to deliver insulin automatically. A similar system incorporating the G6 is expected to be available from Insulet (NASDAQ:PODD) in 2020. The G6 is also being incorporated into smart insulin devices at Eli Lilly and Novo Nordisk, the two biggest insulin drugmakers. Furthermore, Dexcom’s collaborating with Alphabet spinoff Verily on the G7, a cheaper solution that could help insulate it against Abbott beginning late next year. There’s no telling how market share will shake out, but Dexcom reports its most recent quarterly results on May 1, so investors will want to tune in to see what it says about the competitive landscape, market share, and its progress on the G7. Brian Feroldi (Tandem Diabetes Care): I worked in the diabetes industry for more than a decade, so I’ve been following Tandem Diabetes Care since its product first hit the market. I’ve been highly skeptical of the company for years, since I didn’t think its product offering was different enough to set it apart in a crowded market. I even thought the company was going to have to close up shop last year, since it was running out of money and its stock price had fallen drastically. Thus far, Tandem has proved me wrong on both accounts. The company has done an incredible job at stealing market share from the likes of Medtronic and Insulet. What’s more, the stock price has seen a remarkable recovery ever since the company performed an incredibly dilutive common stock offering in early 2018 — Tandem sold 34.5 million shares of stock for just $2 each, which diluted existing shareholders by several hundred percent at the time. Tandem is in a much better financial position today than it was just a year ago, and it looks poised to continued rapid growth. Management is calling for revenue growth of at least 39% in 2019, which is a clear sign that it expects the company to continue grabbing market share. That fact alone puts this company high on my watch list. To be clear, “watch” is the keyword I want to emphasize. Tandem does look poised for continued growth, but I can’t help thinking Wall Street’s enthusiasm for this company has gotten way ahead of the fundamentals. Shares are currently trading for more than 20 times trailing sales, a figure that’s pricing in a lot of continued prosperity. While I’m no longer fearful about this company’s ability to survive, I do question whether it can live up to the extreme optimism baked into its share price. After all, the company is still squaring off against formidable competition, its longtime CEO is stepping down, and it’s still expected to post big losses both this year and next. When combined with an astronomical valuation, I can’t help thinking caution is warranted. I’ve been dead wrong about Tandem before, and it’s possible the company could go on to be a great investment from here. However, my view is that the risk/reward ratio is very unfavorable at today’s prices, so I’m happy to watch this story from the safety of the sidelines. Chuck Saletta (Medtronic): Type 1 diabetics are typically totally dependent on externally supplied insulin for their survival. Without it, their bodies can’t metabolize sugar properly, and they would eventually die from the disease if left untreated. The challenge with treating diabetes with externally administered insulin, however, is that patients need to be careful how much they take and when they take it. Dosing insulin incorrectly can itself cause health problems, so vigilance is the constant refrain of Type 1 diabetics who want to live long and otherwise healthy lives. Yet while there still isn’t a clear cure for Type 1 diabetes, there is a treatment that can help sufferers of the disease better manage their condition. It’s called an insulin pump, and it can monitor diabetics’ blood sugar levels and automatically provide appropriate dosages as needed. The typical insulin pump user has better A1C scores — an important measure for how in control a diabetic’s condition is — and lower risks of complications than those that don’t use the technology. When it comes to insulin pumps, Medtronic stands out as a clear winner in the space. Its pumps have been called “probably the closest systems to artificial pancreases available on the market today.” That leadership position gives investors reason to believe the business has staying power. The fact that its shares have drifted down over the past six months makes it worth looking at today. Thanks to that downward direction in its stock price, Medtronic can now be purchased for around 16 times the company’s anticipated forward earnings. With those earnings expected to grow at around 7.8% annualized over the next five or so years, today’s investors are getting an opportunity to consider buying a strong company at a reasonable valuation.